Posted this on rv-pro.com in response to a Social Media expert’s blog promoting her service to Dealerships. I explain why Social Media is not very helpful for Search Engine Optimization (SEO), because of the way consumers search. Using social media for better placement on search pages does not help much, if at all, because dealerships are indexed for a geographical area and brand/product lines already. You are indexed by your mailing address and brands you carry. 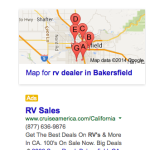 Consumers searching for a dealer lot nearby are searching with keywords like: ‘RV dealer near [city name]’ or ‘rv sales [city name]’ (for example RV dealer near Bakersfield–or more likely ‘rv for sale Bakersfield’). Or by brand: ‘rv brand near where I live’ (for example ‘winnebago dealer near Cleavland’). No amount of SEO trickery will get a Cleavland dealership to appear on search pages for ‘Winnebago dealer near Bakersfield’. Nor should they, as consumers are looking for a local dealership lot. If a consumer is searching a brand name you don’t carry, you can’t SEO your way onto their search page. You can _buy_ ads on theses valuable search results pages, using AdWords. Social Media is useful to develop relationships between individuals, or individuals and brands. The connections build brand loyalty. But Google search can’t be easily tricked, even by Google+. Posted in Uncategorized and tagged google maps, SEO, social media on May 6, 2014 by david.